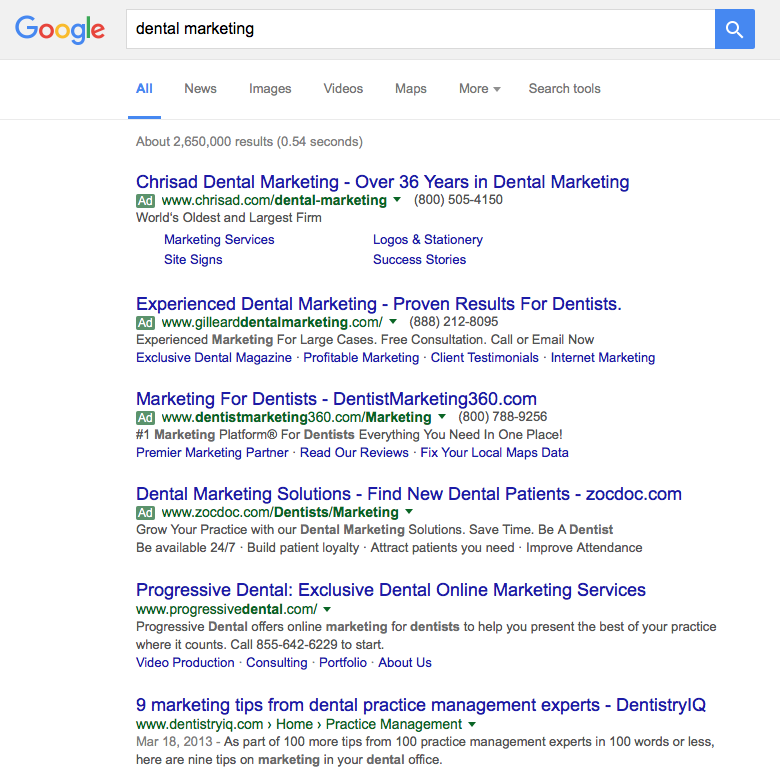 If you go to Google right now and do a search for "dental marketing," you’ll see about 2.6 MILLION results (give or take). 97% of what you’ll end up reading is junk. It’s regurgitated advice with no real actionable content that is put out by marketing companies. If you're a dentist, an orthodontist, or a practice manager, you know exactly what I’m talking about. You’re paying for “marketing services” in some way, shape, or form (probably from multiple vendors), but don’t really know what you’re getting. When I sat down to write this article and shoot a few videos, I was going to go over some "dental internet marketing tips" to help you get more new patients. Sometimes though, you just have to go with your gut and say what needs to be said. Therefore, I’m flipping the script…going off the cuff so to speak…and revealing three of the biggest problems I see in the world of dental marketing and practice performance. Below you’ll find three videos (as well as a little write up on each). Watch them, read the content that goes along with each video, and then take a good, hard look in the mirror. "Oh boy, another colorful, automated report from my marketing company with a bunch of stuff I don’t really understand!" Most of those stats that you don’t understand are called vanity metrics…and they can be deadly. That may mean more new patients or it may mean booking more patients for higher value services (porcelain veneers, dental implants, etc.). Either way, it comes down to increasing revenue. That’s what marketing is supposed to do. None of that stuff really matters. Sure, improving all of those things are important to a certain extent, but it doesn’t matter if the new patients aren’t there. You’ve got to reprogram how you view your marketing. You can’t assume that, because vanity metrics look good, you’re doing all you can to increase your revenues. Vanity metrics can give you a good pat on the back, but they’re pretty lousy at putting cash in the bank. I’m not knocking/bashing your front desk team; you probably have some phenomenal employees who have been with you a long time…you love them, patients love them, and they are like family…I get it. But sometimes complacency sets in when there is a lack of accountability, especially when it comes to booking new patient appointments. After all, your front desk team gets a check every two weeks anyway, right? So what incentive do they have to really “push the envelope” and become a “new patient booking” rockstar? Whenever we start working with a new client (via our SharkTalk service, which you can check out here), they are floored at the amount of missed opportunity; and the “missed revenue” is being dropped at their front desk. Simple in theory, but not so simple in application. I don’t want to go into a full-blown product pitch, but SharkTalk does all of that for you. So if you want to stop losing revenue, you need to be, not only recording, but listening and scoring your calls. Want to learn more about how much revenue you’re losing each month on the phone and fix it? You’re the most beloved and experienced dentist or orthodontist in town? Doesn’t matter. You’ve won awards? Doesn’t matter. You’ve been featured in magazines or local publications? Doesn’t matter. None of it matters if your web presence makes you look like a commodity. Very few dental and orthodontic websites do anything to actually differentiate themselves from the practice down the street. What would happen if you made an investment in putting your best foot forward online? What if your website wasn’t just good enough, but was actually GREAT? What if you knew your local market like the back of your hand and could market to them in a way that they actually enjoyed? What if you were a "thought leader" in the dental or orthodontics field, and your local market clearly knew that you are the best choice to solve their problems without question? Think you would increase your practice revenues substantially? I know you would because I’ve seen it happen with dentist after dentist, and in market after market. If you’re interested in seeing how we can help you turn “good enough” into great, check out our website at KillerShark.me. Are you falling victim to one of them? Don’t worry...you’re not alone (most practices have all three of these problems). I’ll tell you exactly what you need to do to grow your practice with no sales pressure, and you can see firsthand if our services are a good fit for your practice. Schedule your consultation by contacting us below.